This is my first time ever blogging! My friend Iain asked me if I would like to combine my two loves, Writing and The Walking Dead and give it a shot. That being said, I hope you enjoy! 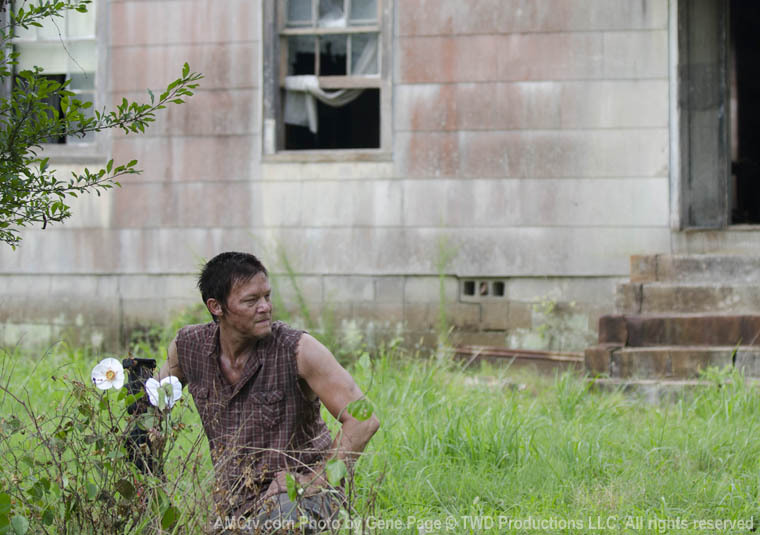 My favorite part of last Sunday's episode of The Walking Dead, was when Daryl gave Carol the Cherokee rose and then explained why he was doing so. The reason I liked this so much was because back on the highway Andrea tries to comfort Carol and Carol stops her. I felt like Carol was saying don't patronize or pity me, just let me have my faith. I feel like Daryl was adding to her faith. I can tell you if it were me I wouldn't be leaving until my child was found. Dead, alive, or walker-fied! That might not sound like much but you need to know one thing about me: I hate "walkers"! I have hated them for a long time, they scare the bejesus outta me! In fact, I didn't even watch the first season of TWD when it aired because I was afraid. I watched all the episodes from season 1 all in one day, all in broad daylight! But I think that is why I am so infatuated with this show. It has made me less afraid and I love the characters! They are so worth a little scare and gore. As for Shane in this episode, at the memorial service I don't think Dale was completely buying his story. I think Dale knows something is not right there. I also think Dale will confront Shane if this is the case. I also think Shane was confessing to Andrea what happened with Otis. I am assuming at this point Andrea didn't catch on or doesn't care because she still thinks they may be leaving together. Or maybe she just loves the shaved head and overalls look? Two things that irked me about this episode were that no one asked Shane about his shaved head. Everyone else has greasy hair, dirty bodies, and filthy clothes and Shane just goes for a new look? Especially when you are staying in a place that has (presumably) limited electricity? I just wanted one person to ask him to hear his explanation. I know it could have been easily explained I just wanted to hear it. I guess I am a details person. The other thing was that no one told Hershel about the well walker. I am thinking that is something the land owner should be notified about but maybe that will be covered this Sunday. I am really glad after watching this episode that I have a covered well for my well water. 1. Welly split in half! 2. Maggie and Glenn "going to the pharmacy"! 3. Lori's pregnancy tests positive! Well that is it for my very first blog post, I hope you enjoy reading it because I sure enjoyed writing it! Thanks again for the blog post, really enjoyed reading it!